The first hotel in Oregon is the EXCHANGE HOTEL, which was built in 1845 on the south side of the square. This business failed and the hotel was then purchased by Richard Chandler. It became known as the CHANDLER HOTEL. This was a booming business! It was reported that on some days 150 pounds of meat were consumed. One day in the 1880’s, local butchers, Doolittle and Hanan, supplied the hotel with 400 pounds of meat. In 1885, the hotel burned down, and later, in 1898, Charles W. Netherwood built the present Netherwood block. 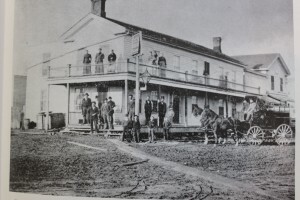 Another early hotel, the OREGON HOTEL (Depot/Railroad Hotel) was located near the railroad depot on the north side of W. Lincoln and Market Streets. The primary customers were the salesmen. They would arrive on the train, stay for a few days and take orders from the local merchants. (This site was home to the Allen Lumber Co. and now houses the Oregon Area Historical Society Museum). This hotel was also the victim of fire and burned down in May of 1906. The fire bell went off in the middle of graduation ceremonies at Cronk’s Opera House. The graduation ceremony was put on hold, as the fathers, grandfathers, and others dealt with the fire. From Jerry, 7/21/16–While I was gathering info. for the 1916 August history timeline, I found this note in the Observer. 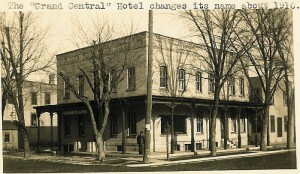 A third Hotel was the GRAND CENTRAL/PORTLAND HOTEL. This is the present site of Madsen Park. Originally on this site was a home owned by John D. Tipple and later owned by J.P. Main. The house burned in 1873. The Grand Central Hotel was built between 1880-1883. In the early days, this hotel was managed by the Monks. They had managed the Chandler Hotel until it burned in 1885, and then took over the Grand Central. Mr. and Mrs. John Walters ran a hotel in Stoughton for a few years and in 1894, they bought the Grand Central Hotel. At some point, the name was changed to the Portland Hotel. After the hotel business declined, the front sections were owned and operated by various businesses and the back section was used as a home and for a few rental rooms. Paulson, Florice. A Walk Back in History: Did you Know?